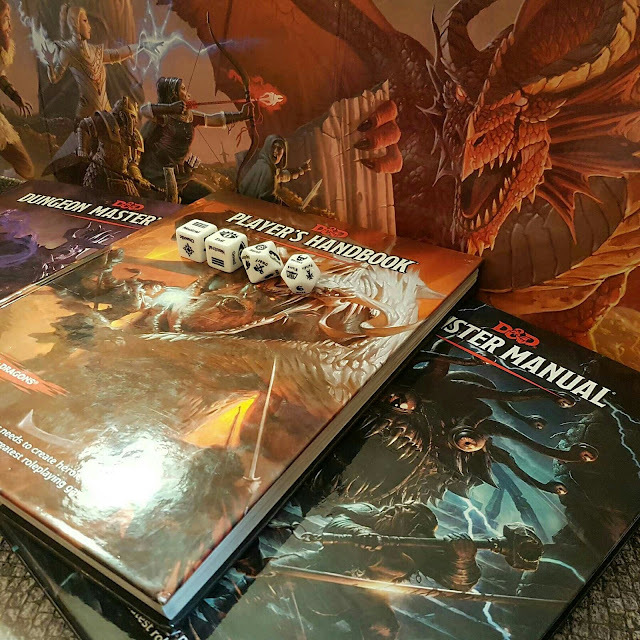 Without a doubt, Dungeons and Dragons, D&D, or DnD can be one of the more daunting games to get into for uninitiated. The Rule Books are huge, there are dozens of supplements, minis, dice, a whole culture around it, etc, etc. It is hard to figure out where to get started, and what exactly you need. Let's get this one off the table right away. 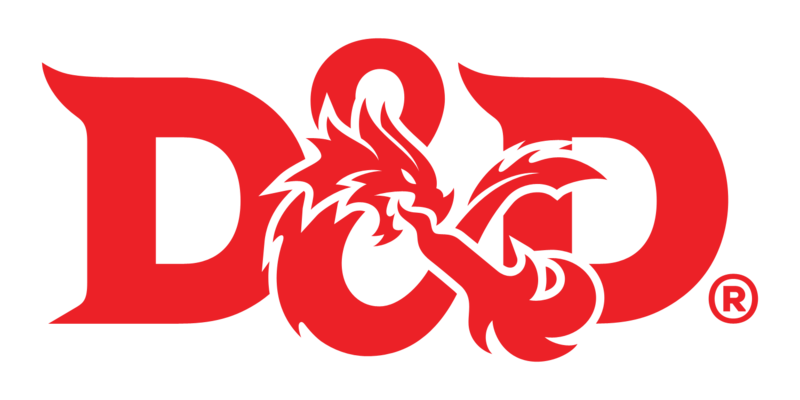 For those of you who don't know, Dungeons and Dragons is a tabletop roleplaying game where one player (the Dungeon Master or DM) guides a group of adventures (the players) through an interactive and unpredictable story. This is done using dice for random generation, a set of rules that give the game structure, Character sheets that describe each player's fantasy character and a prepared adventure that the DM walks the group through. So with that rather dry description out of the way, DnD is the very first roleplaying game system upon which all other RPG's have been built upon. This includes more well known Video Game RPGs like Skyrim, or Diablo, and those who play that sort of game will find many of the systems familiar. What they will be surprised by however is the freedom you have in a Tabletop RPG. There are no invisible walls, and you can interact with everything. One of the great things about DnD is that it doesn't actually require that much to get setup, however there are a couple things you will need. To learn the system of the game you will need access to the Rulebooks. At the game's most basic level you can simply read the Player's Handbook and have an understanding about how the game works. I however, recommend that whoever is DMing the game also get a Dungeons Master's Guide and a Monster Manual. This will give them expanded rules and material to work with. The current edition of Dungeons and Dragons is D&D 5. Which is shown in the picture above. You will find this edition in just about every game store. After 5th, 4th and 3rd Ed are also usually available in most stores, but for 2nd and 1st you might have to do some more looking. You can also find PDFs of many of these games from RPGdrivethru. Great site for material on a small budget. I recommend trying out a few editions. They all have their different flavours and you might find something you like better than the current system. As a group, JADE's favourite edition is 2nd, so don't be afraid to go back in time and explore your options. I also recommend getting a set of JADE's RPG Character Dice to help you generate a few ideas for your first character. We make themselves and are a great addition to any dice bag. Whether you use a Phone App, a Computer Program, Custom make them, Download PDFs and print them, or simply Photocopy them from the back of the Player's Handbook, you are going to need to record your characters, and for that you need character sheets. 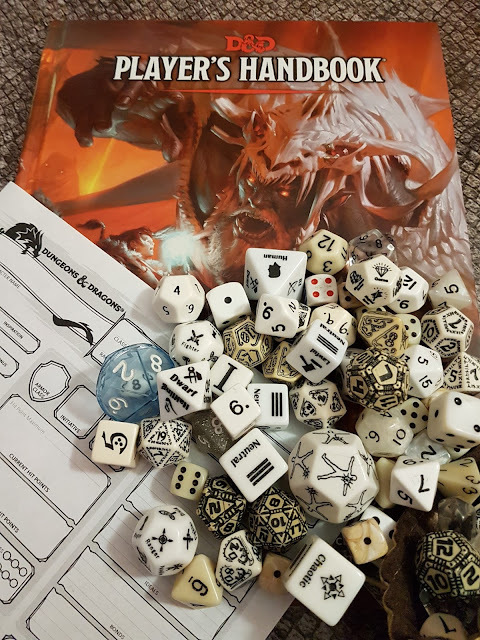 So however you do it, get your sheets, and start creating a few characters and let you imagine run... With the help of our RPG Character Dice of course. Do I Want to Play or Host? Shameless promoting aside, Now that you have your dice, books, and have probably tinkered around with a character or two, it is time for a decision. Do I want to be a Player or do I want to be a Dungeon Master. As a player you will be one of the adventurers in the campaign: exploring new worlds, meeting new people and likely murdering more of them then you would initially expect to. Your job here is to think of an adventurer that fits into the DM's campaign, that works with the other players to some degree, and of course is interesting and fun to play. As the DM you will be writing an open ended story that you will guide the players through. 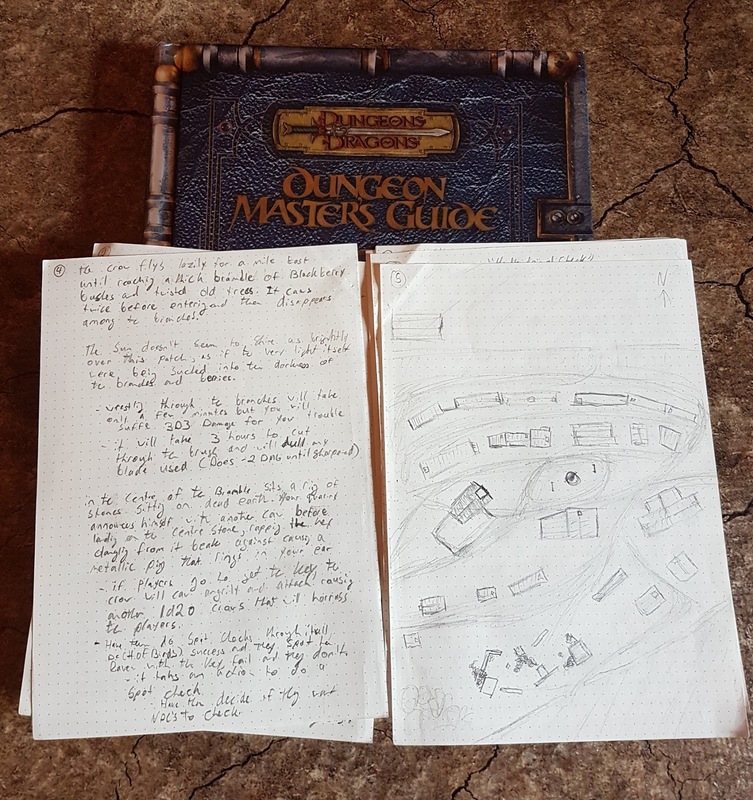 It is much more work as you have to write a story, and keep extensive notes on the happenings of your players and your world as they play through each game. Both are great roles, and I do recommend trying both over the course of your DnD career. Having a perspective of what it is like on both sides of the DM's screen will only improve your game play. Both players and DMs will need to create a variety characters to familiarize themselves with the rules, and also learn what is possible for each race and class combination. 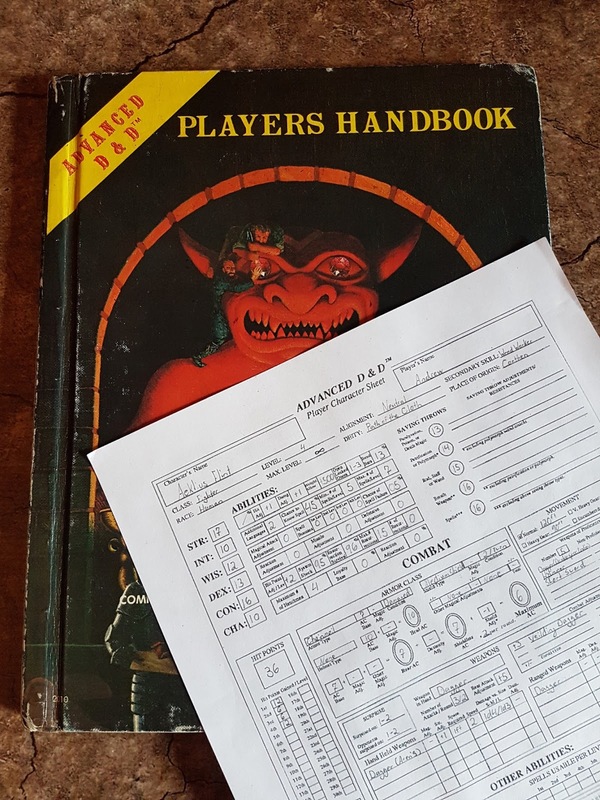 With the exception of 1st Ed, making characters is very easy and straightforward and each of the Players Handbook's have a well explained walk-through (1st Ed sort of has one, but since it is from 1978 you will likely need to go over it a few times before everything clicks). However, Once you have the system of character creation down, you will see the real key to creating a character is more then perfectly recording their stats though; you will want to think about who this character is, and what they want out of life. In the most recent version, 5th edition, there is a wonderful system called Background in the Player's Handbook that will you help you choose and roll through an interesting backstory giving your character some personality. The best piece of advice I can give you is this: DnD is a team sport and it is unlikely that your character is the main character in the campaign. So design a character who could be invested in the adventure, not in themselves, and you will have a much better time. To be blunt, it is likely that your first game will not go as planned and may very well spiral into catastrophe. Managing a story, with players and non-player characters to interact with is a difficult task that takes years to truly master. So don't give up if things don't work out for your first go, it literally happens to everyone. Getting started on your campaign can be daunting, so just take it one area at time. If your players start in a town: map out the town, and take notes on what can happen in each area. Place major plot hooks in areas the players will definitely go and can easily find, and move those important plot hooks into the player's path if they have not found it themselves. 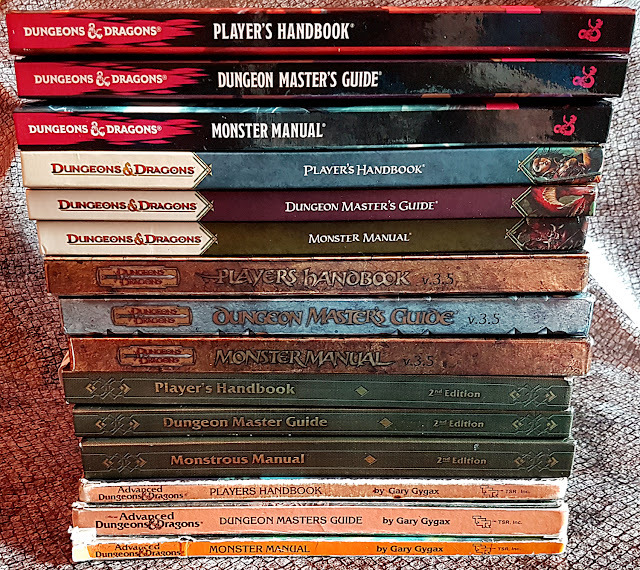 DMing is pretty similar in all editions, but you will need know the rules inside and out. So start studying, as your word will be the final say on things when questions of rules comes up. Despite this power, don't be afraid to poll the group on what they think about rules interpretations. Sometimes it is better to come to a group consensus then force it with an iron hand, and you would be surprised at the number of great ideas your players will throw at you. My final piece of advice here is perhaps the most important. For those familiar with JADE you will have heard me say it before: Talk to Your Players. Let them know your grand plans for the next few steps of the campaign so that they know what they are playing towards. You don't have to spill beans with all the details, but give them an idea of where you want to take the game. This makes sure everyone is happy and informed about what's going on in game, keeps them on course, and it also helps reveal what plot hooks have peaked their interest. This will make the game flow better and make it more fun! If you work as a group, DnD can be an amazing experience unlike any other. So promote cooperation, promote exploration, and keep your players in the loop. First things first: just ask your friends. More of them will have an interest in playing then you think, and people will surprise you at how well they play. So give anyone who wants to join a chance. If your friends are not interested then I recommend turning to Reddit. I have several friends who participate in DnD games over the internet and it is all arranged through there. Just shout out and see what you can find! Barring that you can also look to your local game shop and see if there are any groups. some larger shops even have billboards and wanted posters for Players and DMs. So you do have a lot of options. However if some how you are unable to find anyone to play with... You can actually play DnD solo. You use pre-written adventures (of which there are 100s), reaction tables to roll for NPCs, and just be honest about what the characters you created would do and the rolls that happened. It sounds odd; but setting up a castle style dungeon for your character explore and loot their way through can be crazy fun to run through by yourself. So hopefully those tips should help you get started and exploring the game of Dungeons and Dragons. Also, if fantasy isn't your jam, or you want something more specific take a look at RPGGeek there are thousands of RPG systems out there and you will probably be able to find something that is more to your liking. At JADE we also regularly play the Sci-Fi RPG Traveller, and the Lovecraftian Horror RPG Call of Cthulhu. So be sure to give those a look!